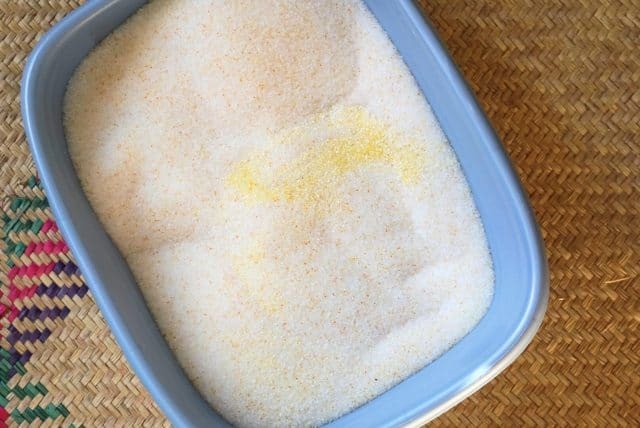 There are literally hundreds of types of cat litter available on the market today. But none are quite like PrettyLitter —the popular health-monitoring cat litter. What’s PrettyLitter, you ask? We spill all the beans in our ultimate PrettyLitter review below! PrettyLitter is a revolutionary brand of non-clumping cat litter that tracks your cat’s health. Moreover, PrettyLitter is changing the way cat owners experience the litter box. 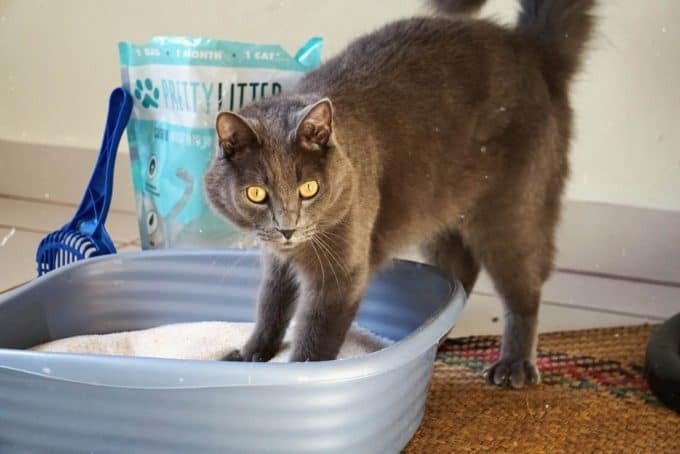 It not only helps you catch underlying illness in your cat ahead of time (potentially saving your cat’s life), it also makes cleaning the litter box easier than ever. The litter itself is comprised of silica gel crystals instead of clay, which is safer on the environment, our cat’s, and us humans too, as it is virtually dust-free. One 4-lb bag per cat per month is all you need. Scoop the poop daily, and mix together the litter and urine. It’s that easy. PrettyLitter is “pretty” unique when it comes to its functions. There are several crucial features PrettyLitter takes the lead on vs. normal commercial cat litter. The litter is a mix of silica gel crystals and indicators that change color depending on your cat’s acidity and alkalinity levels present in their urine output. Upon contact with your cat’s pee, the indicators change color. 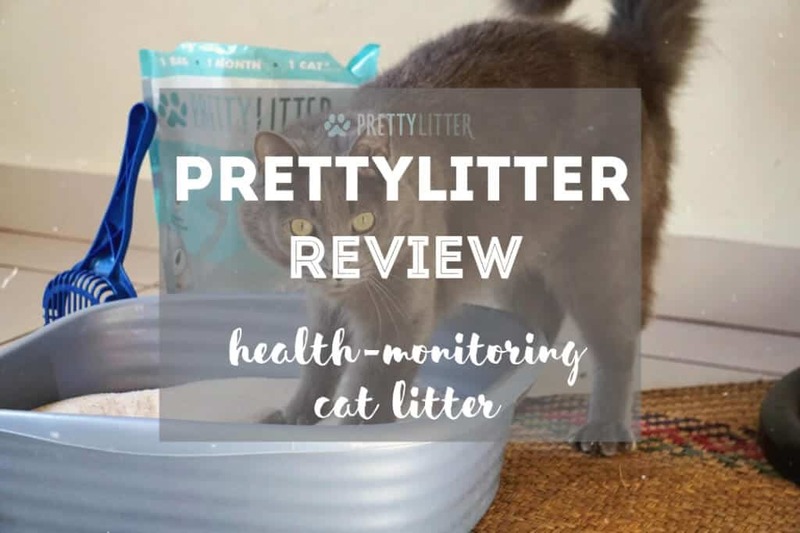 PrettyLitter helps to reveal underlying medical issues in your cat that you may not otherwise be aware of. Remember, it only signals that there is a potential health issue, and does not serve to diagnose your cat. The color changes below can signal the following potential health issues. Red: Red detects blood in the urine. Red could potentially indicate a common feline illness affecting the urinary tract known as Feline Lower Urinary Tract Disorder (FLUTD). The color red could also signal the presence of bladder stones or inflammation, kidney stones, and more. Blue or Dark Green: Blue or dark green means high alkaline levels. Although not as alarming as red, this color may also indicate various types of urinary tract infections in your cat. It’s important to treat this as soon as possible before the development of UT crystals/stones begins to form. Orange: Orange signifies abnormal acidity in your cat’s pH levels. Unbalanced acidity levels could lead to illness such as kidney tubular acidosis. Acidic urine also encourages the growth of bladder crystals. Yellow/olive green: Normal pH levels. You have a healthy cat! If you’re curious about your cat’s current health, give PrettyLitter a try. But if you’re still unsure about whether PrettyLitter is right for you, read more about its benefits below. When you think of the litter box, you might think first and foremost about the nasty litter box odors. Well, with PrettyLitter, you can experience the litter box in a whole new way. We were really surprised at PrettyLitter’s “odor-free” guarantee. PrettyLitter is scentless & odorless. It doesn’t have a particular perfume about it which will put your kitty’s nose up. So how does PrettyLitter combat odors? By absorbing odors, rather than covering them up. Traditional clay litters are packed with artificial scents to cover up cat pee and poop odors. And while PrettyLitter won’t whisk your cat’s poop smell away, it will effectively trap and absorb odors. You don’t need to remove the urine. Therefore, there’s no need to replenish with fresh litter for 1 month. The litter locks in odors and eliminates moisture, keeping the litter box (and your cat’s paws) dry after each use. Simply put, the silica gel crystals trap the odors while eliminating the moisture. In order to keep PrettyLitter working at its best, you need to add 2 inches of litter. Swirl around the litter every now and then. This is so that the urine-trapped crystals aren’t always getting peed on, as cats tend to pee in the same location. Whether you have an automatic litter box or a basic manual one like ours, PrettyLitter makes cleaning the litter box super easy. Just scoop the poop out daily and toss. Mix together the litter and you’re done! The silica gel crystals make this litter virtually dust-free. Less dust = less mess and fewer allergens. Virtually dust-free because it still as a very, very fine dust after about 3 weeks of usage. You can only notice it when the sunlight hits it, but it’s very fine, and not at all dusty like traditional clay litters. So far, we have been testing PrettyLitter for the past 2-3 weeks. We still have another 1.5 weeks to go before we toss and replenish. That being said, already after 14 days, the litter is still odor-free. There is no urine smell like some other reviews claim. However, we only have 1 cat and are using 1 large litter box. We have read in other reviews with multiple-cat households that the crystals no longer absorb the pee smell with several cats. However, PrettyLitter does state that multiple cats need their own litter box (plus, you need to monitor each cat’s pee, so sharing isn’t ideal anyway). As for us, one 4-lb bag for 1 cat for 1 month is pretty accurate. So far, no odor and our curiosity about Yoda’s pee color has been satisfied. 😉 (P.S. He’s healthy!). The only setback so far is that our litter box has low siding (obviously not PrettyLitter’s fault, lol). And in order for PrettyLitter to be most effective, you need 2 inches deep of litter. Meaning, when Yoda likes to dig like a maniac, he tosses some of the litter over the edges. Luckily this is easily fixable, you just need a litter box pan with higher sides, especially for cats who like to dig a lot. Lastly, not only is the PrettyLitter cat litter great overall, their customer service is cheerful and ready to assist you with your PrettyLitter order. Just contact them should you have any problems! In terms of pros and cons, the positives of PrettyLitter outweigh the negatives, in our opinion. Here’s why. 1. After testing, PrettyLitter really is one of the better litters we’ve tried for odor control. 2. PrettyLitter offers free shipping. 3. Less = More (Requires only 1 4-lb bag of litter per month). 4. Keeps tabs on your cat’s health. 5. Ultra dust-free with low-tracking. 6. Non-toxic and eco-friendly means it’s safer on the environment, your cat, and you. 7. It makes it so easy to scoop daily, keeping the litter fresher longer. 1. PrettyLitter is more $ than traditional litter (but offers higher value, so..). 2. Multiple-cat households might need to add additional litter boxes to isolate each cat’s pee. As you can see, the pros definitely outweigh the cons when it comes to PrettyLitter. So far, we’ve used it for 3-4 weeks and I’m still so surprised that ALL of Yoda’s pee is still in that box, yet it doesn’t smell! Want to learn more? Here we break down the cost of PrettyLitter, the odor control, and the efficiency (how well it works!). Yes, PrettyLitter costs a little more than your average clumping clay litter. But for good reason! First, PrettyLitter is made from more eco-friendly silica gel. As you might know, clay litters (which are mined in excess) use mostly unsustainable and damaging methods. PrettyLitter is a hassle-free subscription service that delivers right to your door every month. Second, with PrettyLitter, you don’t have to worry about running last-minute to the store to get a bag of litter. Nor do you have to let the litter box go “an extra few days” until you have time to go shopping. PrettyLitter delivers to your door, for free, every month. Subscription prices vary, but here’s what you can expect to pay for PrettyLitter. If you have more than four cats, ordering PrettyLitter remains simple. Just choose how many cats you have from the drop-down box. PrettyLitter is also available for shelters or rescue organizations. Order in bulk and get big discounts! You’ll need to contact them via email or phone, though. Overall, the price remains affordable considering that you only need to buy one bag per month! Remember, a PrettyLitter bag of cat litter is only 4 pounds and lasts a whole month. Traditional clay litter can weigh up to 40 pounds because it needs weekly replacements. PrettyLitter’s formula has superior odor-controlling technology. The silica gel crystals absorb odors, locking them in. You can walk into the room (where the litter box is) and not detect a thing. It’s certainly different from the “usual” litter box experience. Yoda is particularly doing well with this litter, too. Now, he is covering up his poop better than with alternative eco-friendly litters we’ve tried. Since the silica gel crystals are small, he is better and digging and covering up his business. We haven’t had a stinky poop smell linger in the house for 2 1/2 weeks since using PrettyLitter! 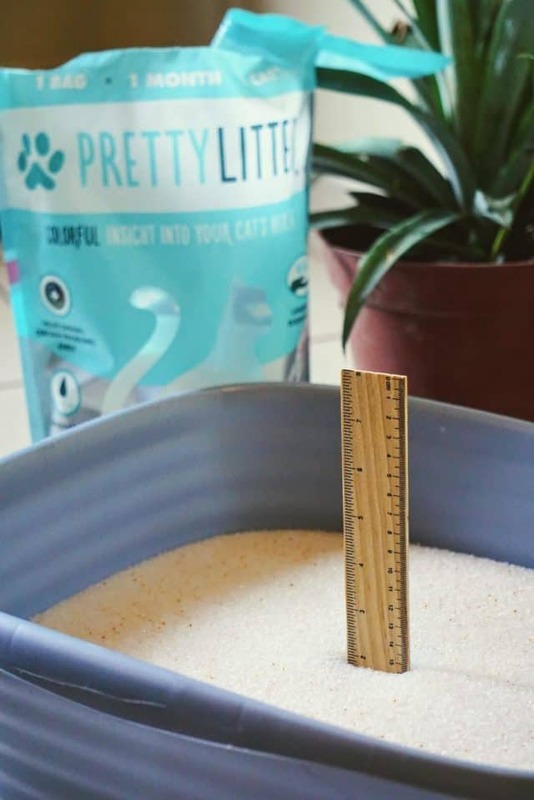 PrettyLitter works on contact with your cat’s pee, so you see results in an instant. This is great if you suspect something’s up with your cat since you can immediately identify (via the color change) if there is an underlying medical issue needing attention. 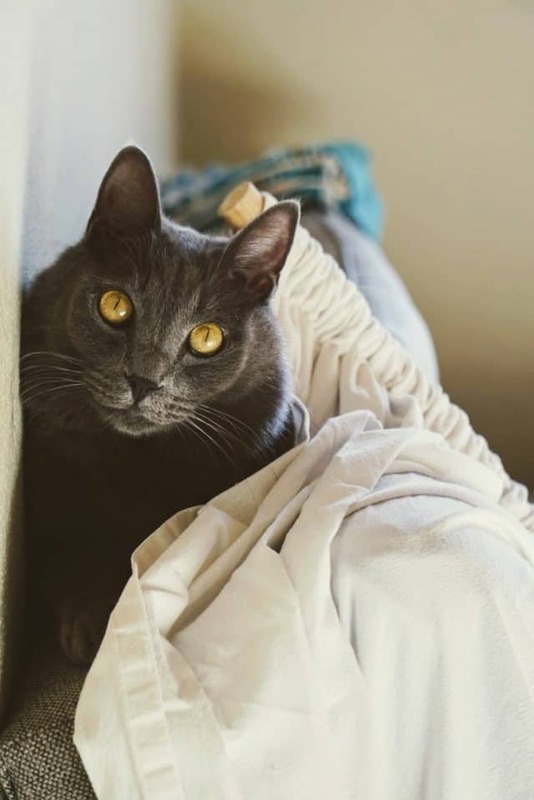 Since cats are extremely skillful at hiding illness, PrettyLitter’s formula is pretty revolutionary when it comes to your cat’s overall health status. Even if you find PrettyLitter too expensive for monthly use, using it at least every couple months could help catch illness early. Remember, the best way to catch illness is by having frequent check-ups at the vet, providing a nutritious diet, and an active lifestyle. Here are a few answers to some of PrettyLitter’s frequently asked questions. You can find more answers on PrettyLitter’s blog. Their customer service will also be happy to assist you if you can’t find additional info here or there. No, no. PrettyLitter is a revolutionary non-clumping cat litter. Nope! PrettyLitter is non-toxic and is safe even if your cat ingests it. It is also eco-friendly, land-fill safe, and a better alternative than dusty clay litters. What is Pretty Litter made of? 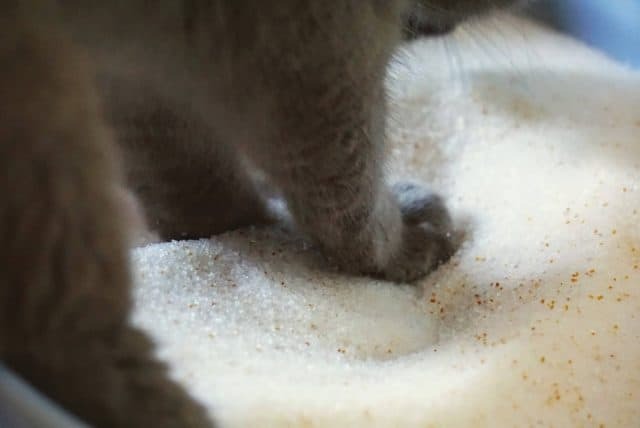 Is silica cat litter safe? Silica cat litter is safe and non-toxic. It provides a safer, eco-friendly option compared to traditional clay litter. It also leaves a lower carbon paw print. At the moment, PrettyLitter is only offered online as it is a monthly subscription service. 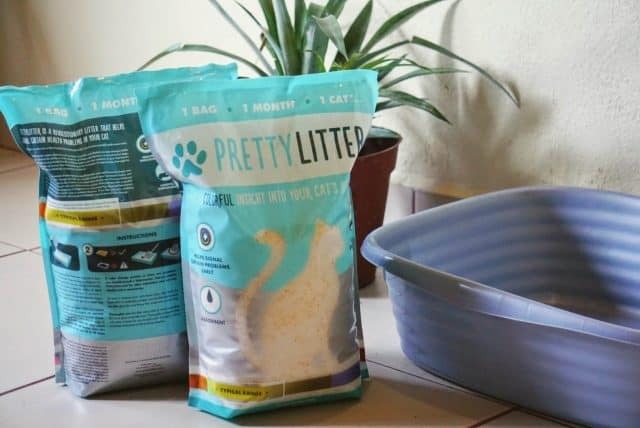 You can try out your first bag of PrettyLitter even from this article! Use our code AFF10 during checkout to get 10% off your first charge. PrettyLitter is worth trying at least once if you’re curious. The litter is more than just a health-monitoring cat litter (and vice versa). PrettyLitter is definitely revolutionary! For us, it beyond satisfies all that you need in a high-quality litter. 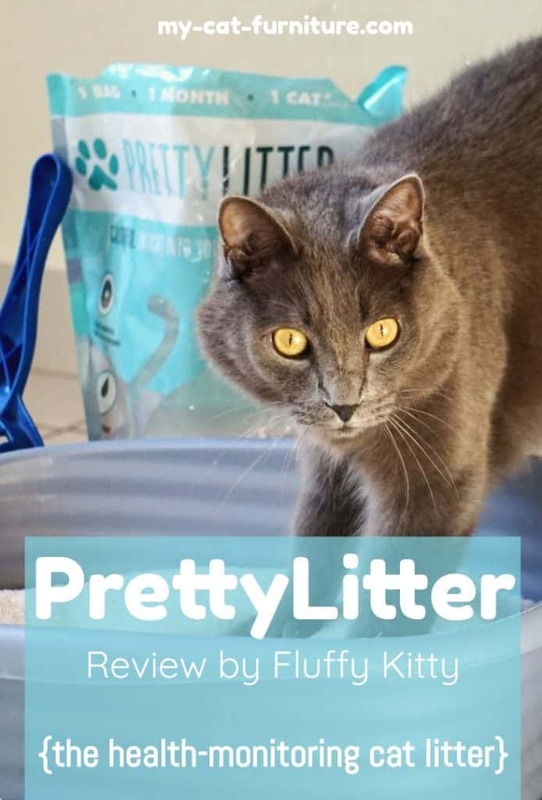 Our PrettyLitter review gets an A+ for odor-control, dust-free, low-tracking, scoopable, lightweight, eco-friendly, and more. If you do try PrettyLitter, remember these color indications below and what they could possibly mean. Don’t forget, PrettyLitter is not diagnostic. It is only a tool to help you catch any sign of illness early. Please consult a vet for questions or doubts about your cat’s health. This post is sponsored by PrettyLitter, but the opinions and contents herewithin are Paul, Brittany, & Yoda’s alone. We really think PrettyLitter is a great cat litter based upon our trial and only wish to share our experience with you. Can 2 Cats Share a Litter Box?